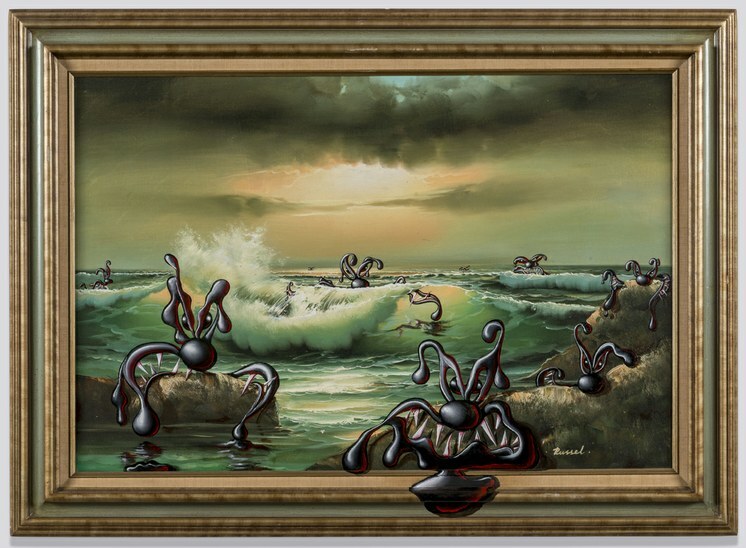 Kenny Scharf, veteran survivor of the 80's East Village art scene, is a pretty well-known entity. 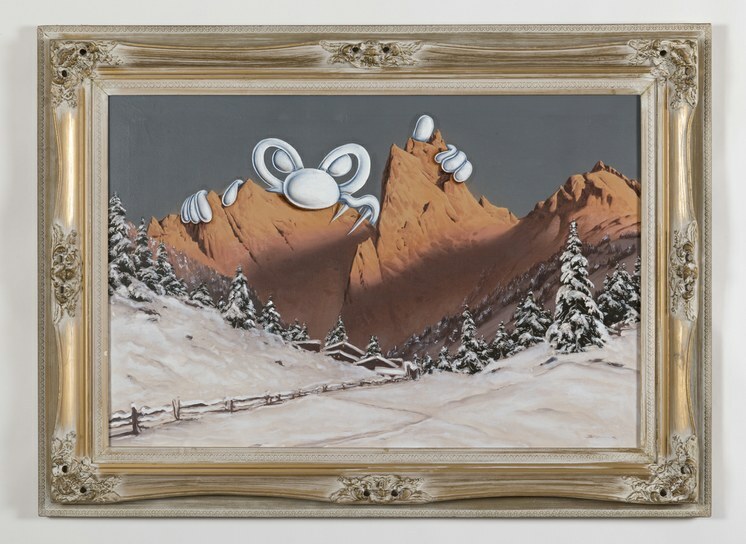 Yet, Born Again, his third show at Honor Fraser Gallery, brings together pieces of his earliest and his most recent art in a happy cocktail of the goofy and profound. Several groups of worn chairs, sofas and tables are gathered around aged TV sets showing Scharf's early 70's videos starring then unknown artists like Ann Magnuson and Keith Haring. Sitting in this comfy recreation of a time of limited entertainment options can bring about thoughts of what led Scharf to look to sci-fi movies or the Jetsons in the first place. His work targeted a heightened consciousness of material culture and planned obsolescence along with our culturally bound fantasies about the future. The future never arrives the way we think it will but fantasies thrive and populate Scharf's most recent work. 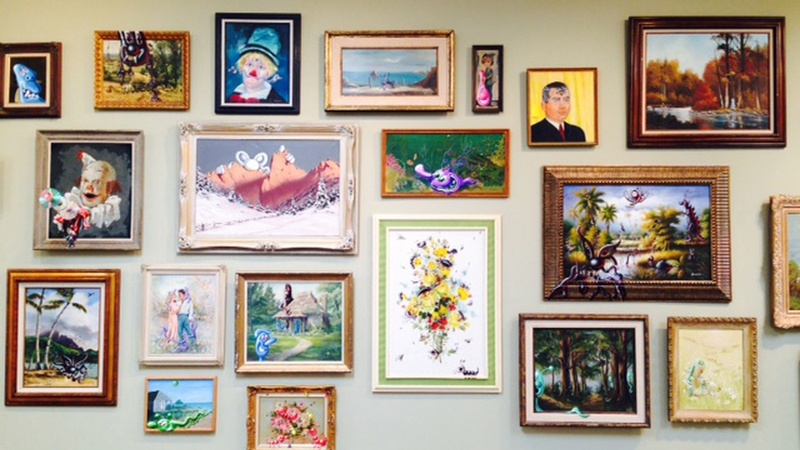 Seventy-five thrift store paintings are hung salon style and Scharf has altered every one of them, always for the better. The original paintings represent the most generic of representational art done by insufficiently talented enthusiasts. 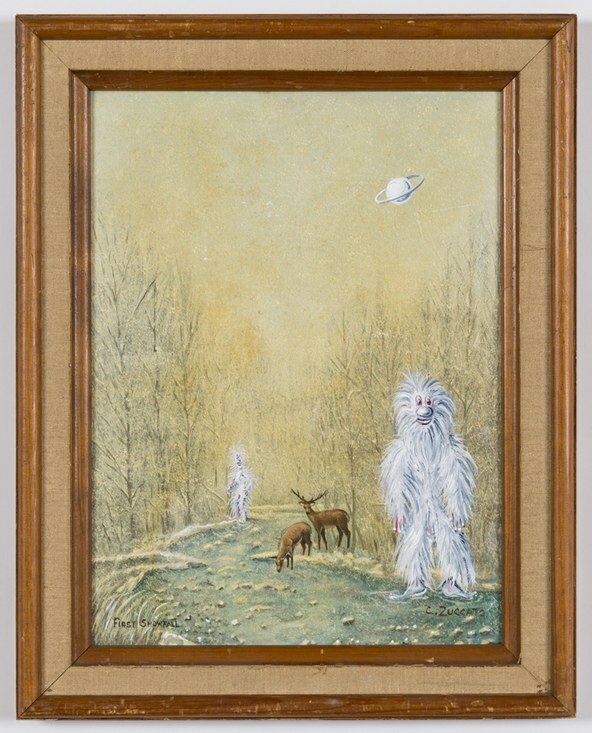 Scharf adds fuzzy white abominable snowmen to a winter landscape with two deer, a smiling cartoon jug to a still life of fruit and cake, slithering googly-eyed monsters that creep over the tops of mountains. With his irrepressible wit, he redeems works for which it would otherwise be hard to find a home. Sometimes, he points to ecological disasters, as monsters populate a beach after the Fukushima disaster, like that other integrator of cartoony and serious bits, Takashi Murakami. With Scharf, it always seems that there is another, parallel universe seeping in around the edges of conventional culture. On view through April 4. His talents are particularly evident in this current show, From Enchantment to Eschaton at a new Hollywood gallery LAM through April 11. 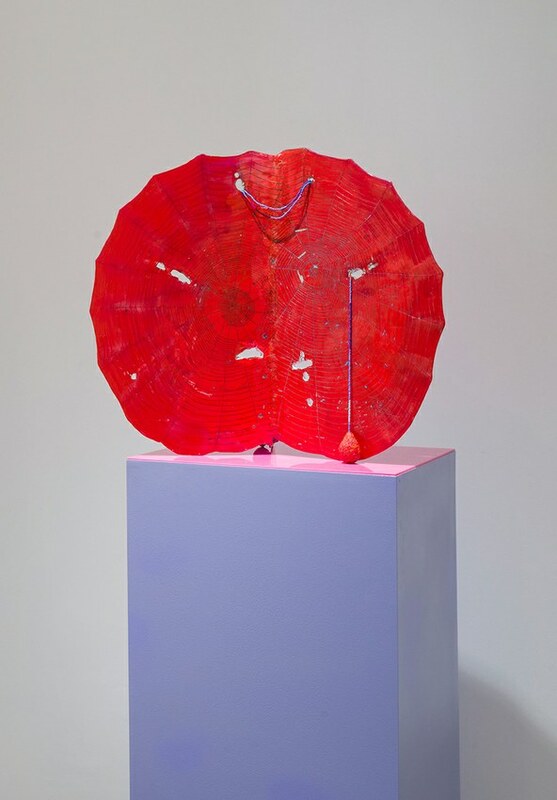 On pedestals around the gallery, there stand leaf-shaped sculptures of thin sheets of cast acrylic that he has carved with the delicate patterns of spider webs, symbolic of a larger interconnectedness. 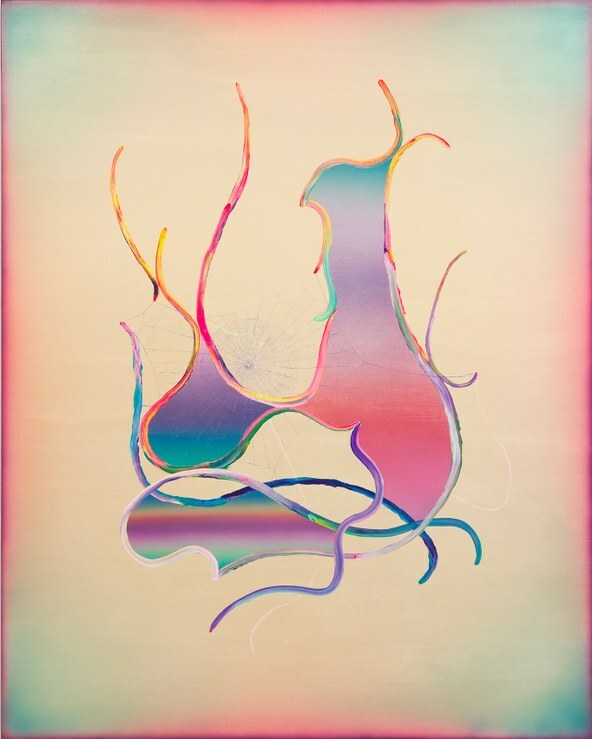 Most are faint pastels, though a terrific one is bright red, with a strand of tiny beads threaded through a fissure, Unfolding the Leaf (Convergence) (2014). Other sculptures feature cubic bases with mirrored tops bearing lit candles and delicate monofilaments that extend from the bases all the way to the ceiling like the single thread of a spider web. Beads of clear liquid glide along it so that the entire piece captures and reflects ambient color. That color is provided by Tull's good-sized auric paintings of glowing pastels topped by calligraphic strokes of pigment. A number of smaller pieces feature such strokes on silvered paper panels on which Tull has etched his last name in a code related to witchcraft. Each work in the show is titled in keeping with the spirit of the show. Here are some samples: Odyssey (transcendent object at the end of time), Imparting Telos, Self-Integrating, Standing here, we are leaning beyond the edge realms (Convergence). The metaphysical references to a spiritual journey from ecstasy to the preparation for the end of time are explored through the formal processes of abstraction. For an additional aspect of the experience, Tull's sound performance takes place at the gallery on March 21 at 6pm.